For those of us who were around at the time it is not difficult to remember the publicity that surrounded Derek Pringle’s call up for the first Test against India in 1982. Much was made of the fact that he was the first undergraduate selected for England since, not so coincidentally the naysayers wrote, the then incumbent Chairman of Selectors, another Cambridge man Peter May, who had been chosen back in 1951. It was said by many that the comparison was odious, and that May had been a great batsman in the making from the moment he first appeared in the First Class game. I remember the point also being made that in his time the Universities, whilst not being the force they once had been, were still rather more than simply cannon fodder for the First Class counties. Above all however most observers who were, supposedly, ‘in the know’, seemed to believe Pringle was nothing particularly special as a cricketer. As a student at the same time as Pringle, albeit at a rather less celebrated establishment than Fitzwilliam College, Cambridge, this reviewer was delighted to see Pringle selected, and I have always felt that international cricket treated him a little unkindly. He always looked a quality bowler to me, not generally blessed with the best of luck, and to expect him, just because he was a capable wielder of the willow, to therefore be able to bat like Ian Botham always struck me as more than a little unfair. What followed was something of an in/out career for Pringle who played 30 Tests over a ten year period, all but five of them in England, his efforts overseas being limited to three matches in Australia at the beginning of his tenure, and two more in New Zealand at the end. The decade over which he played was not one of great success for England, the only series triumph coming on that trip to New Zealand in early 1992. Pushing The Boundaries is an account of those years. It is, essentially, autobiographical in nature although, for continuity, the outcomes of the series in which Pringle was not involved are dealt with albeit in more summary form. Overall the book is not dissimilar to the, in cricketing terms, bestseller of 1997, Simon Hughes’ A Lot Of Hard Yakka. 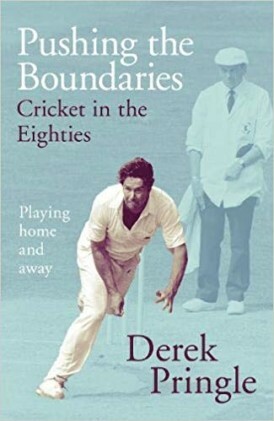 The difference with Pringle’s book is that, as a Test player, the names and occasions he describes are rather better known than the hard slog of the county circuit that was the background to Hughes’ book. One of the areas highlighted is that this was an era when the tabloid press became preoccupied with the non-cricketing aspects of cricketers’ lives, fuelled at least in part by virtue of the fact that Ian Botham was contracted to the Daily Mirror, thus making the other ‘red tops’ that much keener to discredit him. After he retired from the game Pringle became a journalist, primarily with the Daily Telegraph, a newspaper I have not, now rather to my regret, read since my student days. Pringle is not my idea of a Telegraph journalist, having that uncommon ability to write accurately and succinctly about serious subjects whilst at the same time being a constant source of amusement. Inevitably there are descriptions of cricket matches within the pages of Pushing The Boundaries, coupled with tactical insights and analysis, but unlike in the hands of many writers these never become dull, tedious or repetitive. In particular I will mention one passage, a rare piece of cricketing prose that provides a succinct explanation of the mysteries of conventional and reverse swing for those of us whose cricketing aspirations have never stretched beyond the lowest echelons of the club game. It is however the stories of the extra curricular activities that, time and again, bring a smile to the reader’s lips, not to mention a degree of wonderment at just how much alcohol professional sportsmen imbibed in the 1980s. There are a myriad of examples I could quote, but will leave purchasers to discover the detail for themselves. There are, inevitably, well known tales of some, and Botham and Derek ‘Arkle’ Randall loom large in the narrative. There are plenty of cameo roles however, the Middlesex pair of Ian ‘Gunner’ Gould and Norman ‘Flash’ Cowans being two of the more entertaining. It is also worth making the point that Pringle does not restrict the ambit of the book to his time in the England team. Tales of University cricket and the county game add greatly to the entertainment. There is a fine selection of photographs included in the book. Amongst them are some taken by the author and, apparently, the only still images taken by anyone of the incident in 1982/83 when Terry Alderman damaged his shoulder in an attempt to bring down an unruly spectator who had assaulted him. One of my favourite revelations is the one that makes it clear that the rules which, at the time, applied to Australian players unsurprisingly strictly forbade them assaulting opponents, umpires or spectators. Expressly excepted from the protection of that rule however were trespassing spectators, so Alderman faced no sanction, save for the self-inflicted 18 months he spent out of the game injured. As befits a book from a major publisher Pushing The Boundaries has all the statistics that a reader needs, a comprehensive index and is exceptionally well produced. I did seriously consider giving our elusive five star rating, and if truth be told the book probably deserves it, but then authors can’t go around teasing Lancashire supporters of a certain age without consequences. So, for describing Frank Hayes as ‘slightly unhinged’ with providing the full story I have decided to perform an act of pure caprice, and award a mere four and a half. I suspect however that there will be an opportunity to get it back, as Pringle’s very last sentence suggests to me that if he is not already doing so he will soon be working on a book about his time in the press box, which may therefore get a counter-intuitive five and a half star rating!